8mm Tungsten Carbide Rings for Men Women Wedding Bands Koa Wood Black Meteorite Arrow Inlay Amercia Native Hunting Jewelry Domed Comfort Fit. Store Represents for the Best Quality in the Market. Our Goal is to Help Our Customers Getting Better Quality Products and at the Same Time Saving much More Money! If You Are Looking for a Ring that is Scratch Proof and Forever Keeps its Shiny, Our Tungsten Wedding Rings Will be Good Choice for You. If You Can Save Money and Get the Better Quality Products, Why Do Not Purchase from BestTungsten? Crafted from GenuineTungsten Carbide. 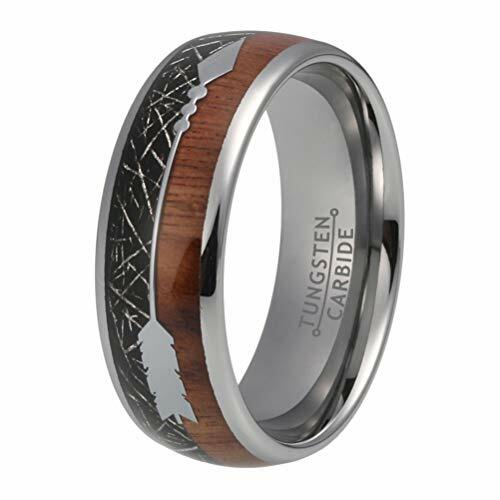 Tungsten Wedding Rings with Natural Koa Wood Black Meteorite and Arrow Inlay Domed Band Polished Shiny, Tungsten Wedding Band Suit for Both Men Women, Excellent Gift Rings for Father, Mother, Friends, Lovers and Couples. Scratch Resistant, Never Tarnish, Great Weight, Handmade Exquist Craftsmanship, Ideal Rings for Wedding, Anniversary, Engagement, Party, Birthday, Valentine's Day, Mother's Day, Father's Day, Thanksgiving Day and Christmas Day. Cobalt Free, Comfort Fit, Water Proof, Safe and Comfortable to wear in Daily Life. The Same Quality as in Jewelry Stores, but just One-Fifth of their Price. Excellent Customer Service, Please Do not Hesitate to Contact Us if You Have Any Issues after Purchasing, We Will Provide Perfect Solution Until You 100% Satisfactory With Us. Due to the Great Confidence of our Products, We Offer 30 Days Money Back Guarantee for All the Tungsten Carbide Rings Sold from Our Store. If you have any questions about this product by BestTungsten, contact us by completing and submitting the form below. If you are looking for a specif part number, please include it with your message.